Littlest came home late from a playdate at the neighbor’s house yesterday. She loves playing with her friend, but dissolved into a sea of tears when she arrived home to find us eating supper casually and in shifts at the kitchen counter. “What’s the matter?” I brushed away a tangle of hair and tears. “I didn’t get to set the table and now dinner is ruined!” She stomped her foot and I silently whispered a prayer that a seven-year old’s tantrum wouldn’t follow. “It’s ok, sweetie. We are having yummy leftovers and a counter dinner tonight.” Our older kids love counter dinners. One coined the phrase for the nights we lean in against the kitchen island and eat whatever is left in the fridge warmed up in the microwave and served from the finest china — paper plates. “IT’S SUNDAY! We have family dinners on Sundays and I get to set the table.” I hugged her tight and felt a huge wave of guilt. The day simply slipped away from me. It wasn’t until 5:45 pm that I looked up and realized there would be no Sunday supper. It happens so easily. We get busy. Good things take up our time and energy and before we know it two days, then three, then more slip by without gathering at the family dinner table. Or maybe we sit down to eat, but there is no communion, no shared stories, no telling of the highs & lows from the day. Some nights even the prayer — where we invite Jesus to join us as host and guest — falls flat. Yesterday at church in a Lenten series on idolatry, our pastor shared the bit about how our checkbook and our calendar reveals much about the condition of our hearts. I think we should add an examination of our dinner tables to this test. I’m re-reading From Tablet to Table by Leonard Sweet. For the third time. I’ve underlined and dog-eared the pages that hardly a page is left untouched. I read a lot and this book resonates deeply — after I got over the pride of wishing I had written the book, of course. I’m a card-carrying table girl. It’s why I write this blog, share recipes and stories of a messy faith lived out at the kitchen table and the turquoise table and the spaces in-between. There is one thing that would dramatically change the world we live in and help return us to our rootedness in Christ: Bring Back The Table! When I lived in France, I was awestruck at the importance of the noonday meal. Two hours in the middle of the day were guarded, protected, and cherished. Banks closed. School children returned home. Stores turned window signs around reminding anyone left passing by on the street they were fermé jusqu’à 02h00, closed until two-o’clock. What was once a normal rhythm of life, at least in France, would be out-right counter cultural in our fast paced society where drive-thru meals are available on every corner. I don’t want a drive-thru faith. Where sermons are ingested on the run between sleep-overs and lacrosse games. And dinners are scarfed as a means to temporarily satiate a worldly hunger. And neighbors are waved at and waved on. So, I’ll make another meal. 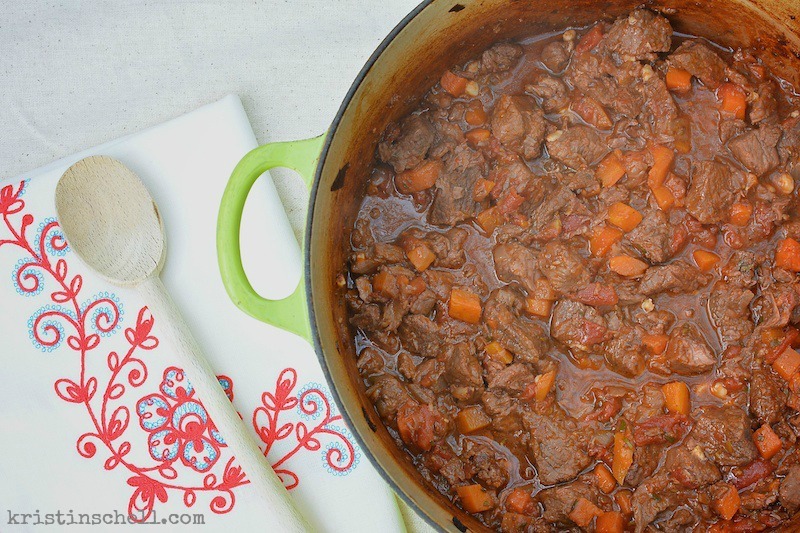 Provencal Beef Stew. And, live in the grace and truth that last night’s supper wasn’t ruined after all. For me or for Littlest. I reminded her another supper is coming soon, one that is glorious and will be the grandest of all feasts. A banquet like no other. In the meantime, in this temporary time between garden and banquet we do our best. We make Sunday suppers for our families. And, invite our neighbors for coffee. And, show up for church when we are tempted to sleep in. And, this is where God meets us. “I can’t wait for that big banquet, mommy. When will God have it?” my seven year old asks. “It’s not for us to know the date or the time. But you have a place at the table,” I kissed her forehead and watched her savor a bite of Sunday supper. In a small dutch oven, heat oil. Add garlic and cook, stirring occasionally, for 5 minutes until golden brown. Remove garlic with slotted spoon and set aside. Add beef to pan and sprinkle with salt and pepper. Cook 5 minutes, browning on all sides. Remove beef from pan. Add wine to pan, bring to a boil and scrape browned bits. Add garlic, beef and remaining ingredients. Bring to a boil. Cover and bake at 300 for 2 1/2 hours or until beef is tender. Serve with crunchy French bread or over wide noodles. I love this … every single word. You are a gift, my friend. To my heart and my soul. And I am yearning, like the sweet Littlest, for the banquet day to arrive. how beautiful:) thank you for inspiring me to see the faith to table connection…life, love, connection, community…so easy to lose sight in our all too busy lives. This looks perfect, the weather is finally cooling off a bit to enjoy a warm bowl full of goodness! May I ask what religious affiliation you subscribe to? I am LCMS Lutheran & thoroughly enjoy your posts! Our church hosts a monthly potluck following church services. It is a nice way of getting to know members (faith community) on a personal level.